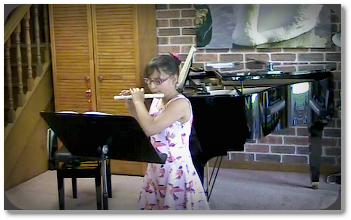 I am pleased to announce Student of the Week for Term One, Week One is 8 year old Anika Pandey, pictured here playing her fife at the 2015 End of Year Student Concert. Students come back to lessons in various ‘states of repair’ after the summer holidays. Some have holes where things that were learned and mastered before the holiday have been totally forgotten and have to be re-learned. Some are a bit rusty and just need to play a bit to get back to where they were and some have been maintained in perfect condition, and pick up exactly where they left off. But it is rare to find a student that has actually made progress and improved over the holidays. Anika is such a student. Anika downloaded the backing tracks to her tutor book over the holidays and played all her beginner tunes along with the backing tracks. What a great holiday fun thing to do! Not only has she learned two new and quite difficult songs by herself but all her playing is now so much more confident and fluent! Anika is looking forward to progressing on to her new ‘proper’ flute this term. Well done, Anika! 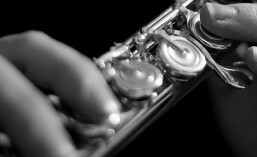 Posted in Fife, Flute, Music Teaching and Learning, Performance Skills and Tips. Did you know that children as young as five years old can can take their first steps in music making and flute playing with an inexpensive, indestructible, plastic instrument called a fife? It looks like a recorder but is held and blown like a flute. For more information contact Cathy.